Zak has no background in racing but has always enjoyed race cars, especially open-wheel race cars. He drove a lightly prepped Audi during a PCA HPDE at Mid-Ohio in 2013. While looking for a dedicated track car he stumbled upon F600 and was instantly sold on the class for a number of reasons…primarily the sound, performance, and the cost of these cars. 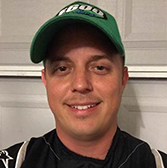 In 2015, with the help of F6R and Satellite racing team, he was able to complete the SCCA Driver's School in an F600 car and earn his competition license. Zak has enjoyed formula car racing for as long as he can remember and visited the Indianapolis Motor Speedway, as a spectator, for Indy 500 races annually over almost two decades as well as F1 races long ago. Zak doesn't have much of a racing background or all the go-fast parts on his car but racing a Formula 600 over the bricks at this legendary speedway is almost surreal and while the finish probably won't be impressive, this is a great experience for him and one he couldn't possibly turn down. At the end of the day this is all for fun in his book and what is more fun than a national championship race at Indy? Zak is looking forward to gaining more racing experience and seat time in these cars.